Cape Blomidon rises majestically from the Minas Basin. It is a beautiful backdrop for the picturesque Town of Wolfville and a photographer’s paradise. The Blomidon Inn is in Wolfville, Nova Scotia. Wolfville, home to Acadia University, is a charming university town situated in the heart of the Annapolis Valley. The streets are lined with stately trees and beautiful Victorian homes reflecting the towns historic elegance. Downtown is bustling and boasts an array of colourful shops. Walking is relaxed and easy along the dykes which offer a magnificent view of Cape Blomidon and the Bay of Fundy. The dykes were constructed by the Acadians in the 1600’s. Still maintained today they protect some of the most fertile farmland from the Bay of Fundy and the world’s highest tides. Nova Scotia’s Annapolis Valley is one of the fastest growing wine regions. This area of Nova Scotia will surely be known as Nova Scotia’s Wine Country. 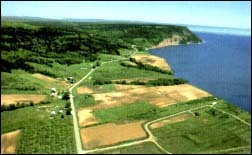 The Annapolis Valley is the second area in North America to be permanently settled by Europeans. The first permanent settlements were in St. Augustine, Florida. In the Annapolis Valley, there are many excellent museums and historic sites to experience this aspect of Nova Scotia’s history. Take a virtual visit to the World’s Highest Tides. Then, come and visit us and experience them for yourself.